Join the ranks of great speakers! 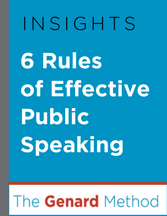 Great speakers understand intuitively how to engage and move audiences. To join their ranks, learn how following these "Six Rules" will lead to your success! Make the audience the center of your universe. Give your purpose most of your attention. Get good at Q & A—really good. Add this practical guide to your speaker's toolbox today!